The Day I Was Kidnapped from A Courtroom! Douglas county Sheriffs deputy’s use Nathan Seim (center) as a human battering ram, to move people questioning why he is being removed from the courtroom for no reason. It’s January 15th, 2015. I am sitting at the defendant’s table in Douglas County District Court. I am there to stand with Tell Shasteen, almost a 7th brother, against a bogus charge of failure to comply. All for asking a police officer why he was being stopped. We patriots came to record and make sure due process was given. Gavin Seim is at the table with us, the rest of the family and several supporters are also in the room. We are, of course, recording. During a recess before Jury Selection, Gavin and Tell briefly leave the room while I remain at the table. The judge has not yet entered. The bailiff enters and informs me that they see there is a livestream up online and we have to stop recording. I tell that we informed the judge in writing that we would be recording and according to Washington state court rules the judge has to give a valid reason for me to turn it off. The bailiff leaves into the judge’s chambers and I motion to mom to get Gavin. She leaves, the bailiff comes back and says, the judge says remove him. “On what grounds?” I ask. I see hands (I didn’t see their faces through this whole thing) grab both my arms and I am lifted bodily from my chair. At the same moment, I see three of my brothers, Grant, Blake and Clark rise with him. I know Neil Seim is up as well, but I don’t see him in my glance. Cory gets up. He’s a patriot, here in show of solidarity. I don’t know him that well, but he is upset. These are the people I saw. I remember mostly their clothing. I know that nearly everyone witnessing the proceedings rises in a wave of solidarity. They place themselves between me and the door, firmly resolved. The Deputies smash me into them, using my body as a battering ram. I remember being pushed into, hitting my dad, hard. He is pushed out of the way. Grant the 3rd, my oldest brother, is a tall, strong man in his mid thirties. He is side by side with several others. I know he’s one of them because of shirt color. I don’t recall faces, except dad’s, a little. It takes a bit of force, but between me and their shoulders, the officers push through. Through all this, no one raises a hand against them. In spite of their violence, my compatriots courageously, non-violently, block their path. Someone’s elbow catches me in the eye. At that instant Gavin runs up. No more than twenty seconds can have passed since I was lifted from my chair. I remember Gavin’s face. Shocked, frightened, but fiercely determined. I am nearly in the doorway now. Gavin wedges his body in it, locking hands and forearms against the door frame. The deputies brace, turn their shoulders to him, and violently hammer both me and their shoulders into Gavin. He folds and is pushed free from the door. I am dragged out out the room and quickly out of the building. The Deputies detained me for somewhere between ten and twenty minutes without ever giving any reason, while Grant and Clark follow and film them. For all I know, that saved me from a beating. While I am detained, both dad and Gavin are led out in handcuffs, placed in patrol cars. This is my part. There is so, so much more. But I am not the most qualified to speak on it and videos are forthcoming. This stand was one of the proudest moments in my 23 years of life. Also, you should know that I am immensely proud of and thankful for the stand of all the patriots there that day. More than that, I am thankful that God and His Son were with us and heard our prayers, and that we were able to be used as an example for justice and that while doing he kept us safe. It’s time to take this on, my friends. You need to start showing up, you need to start standing up. If you already are, do it more. I know I mean to, by the Grace of God, Let’s Take America Back! Douglas County WA Goes to Jury Trial to PUNISH Citizen for Asking a Question! 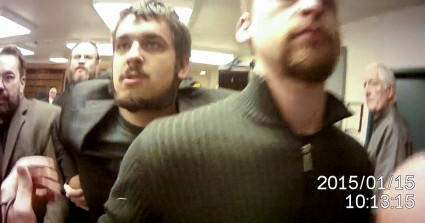 Patriots Pack Court… Douglas County Officials Attack Them!